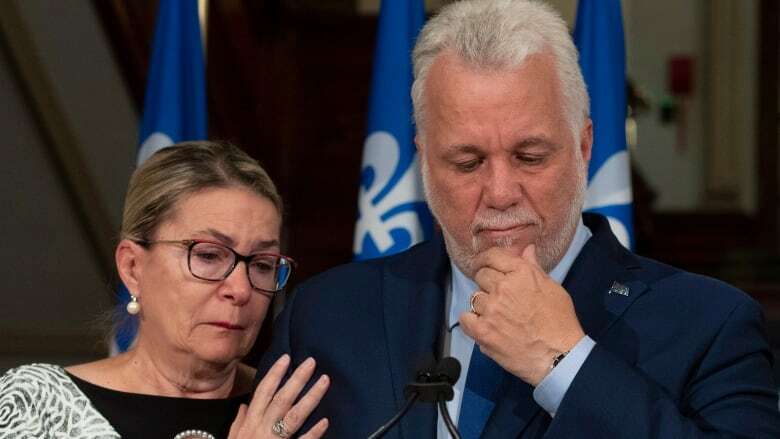 With his wife Suzanne Pilote by his side, Philippe Couillard said he is leaving Quebec in a much better state than it was in when he came to power, but that he has to take responsibility for the Liberal Party's defeat Monday night. Philippe Couillard is leaving politics, he announced Thursday, closing the book on nearly 15 uninterrupted years of Liberal governments in Quebec. With his wife Suzanne Pilote, by his side, Couillard stood at a podium in the lobby of Quebec's parliament building and told reporters he is leaving the province in a much better state than it was in when he came to power. But he said after putting all his energy into public service, staying in politics, in any role, would be "more than I feel I am humanly capable of." "A new person, or maybe even a new generation ... will guide our great party through its next stage." In his usual measured tone, Couillard, 61, defended his record as premier, mentioning the province's solid finances and booming economy, and his government's efforts to match Quebecers with family doctors. But his pitch changed when he started speaking about newcomers to the province. He raised his voice as he said they are not a "threat" to Quebec. "It's the opposite. Each one is an essential asset to our growth. It's up to us to make sure they integrate into Quebec society," he said. The line could be seen as a call to action as his successor, Coalition Avenir Québec Leader François Legault, prepares to take over. Legault ran on a promise to reduce the number of immigrants coming to Quebec, and force those who do make the cut pass a values test and a French test, measures he says will ensure they integrate properly. Couillard was re-elected to his seat in the Roberval riding, in the Saguenay-Lac-Saint-Jean region, with 42.5 per cent of the vote Monday night. However, his party suffered a decisive defeat. The Liberals now have only 32 seats — down from 68 when the government was dissolved. The party received just 25 per cent of the popular vote, its lowest showing since Confederation. Premier-designate Legault acknowledged Couillard's contributions in a tweet, saying politics is demanding and requires courage. Legault also re-ignited the debate over whether civil servants should be allowed to wear religious symbols, saying he plans to introduce a ban to prevent some public employees from wearing hijabs or kippas, for example. Couillard took direct aim at that policy in his speech, despite having introduced a law that would have banned face-coverings for anyone giving or receiving public services last year. That section of the law was stayed by the Quebec Superior Court. "Quebec must remain a welcoming place, a society where everyone has a seat at the table, a place where people are judged by what they have in their heads, not on their heads." A neurosurgeon by trade, Couillard was first elected as a Liberal MNA in 2003, eventually serving as health minister before stepping down in 2008. He returned to politics in 2012 to seek the Liberal leadership after Jean Charest resigned. Couillard won on the first ballot, and led the Liberals into the 2014 election, where they defeated Pauline Marois's Parti Québécois. 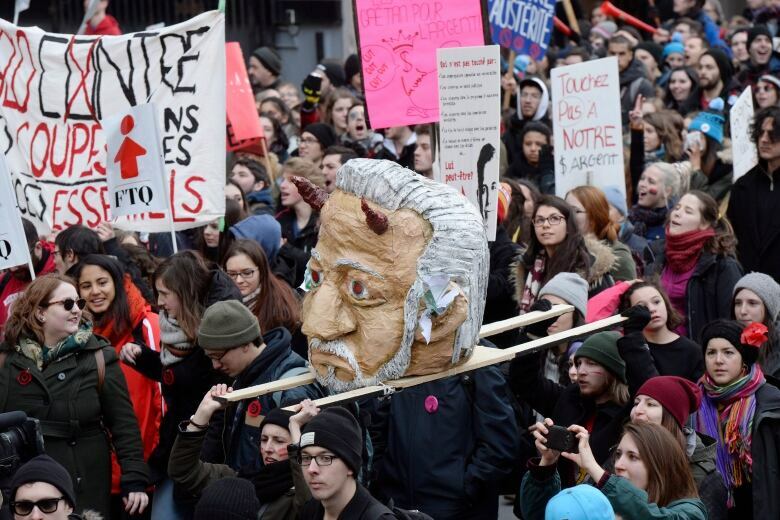 Almost immediately after coming to power, the Couillard Liberals undertook a series of cost-cutting measures that made it possible to balance the budget by 2015, but also angered Quebecers enough to hold protests across the province. The Liberals boosted spending heading into the election, trying to shake its thrifty image, but it appears that wasn't enough to appease those who were still angry. Couillard tried to emphasize his party's economic track record during the election campaign and promised more of the same if the Liberals were re-elected — balanced budgets and more money for health care and education. He also created the Secretariat for relations with English-speaking Quebecers, a move that was applauded by community groups serving the province's anglophones. "I want you to know I did not do this for short-term, electoral reasons, but because of the profound belief in a truly inclusive Quebec," he said Thursday. With Couillard gone, the chatter has commenced regarding who may replace him on an interim and permanent basis. 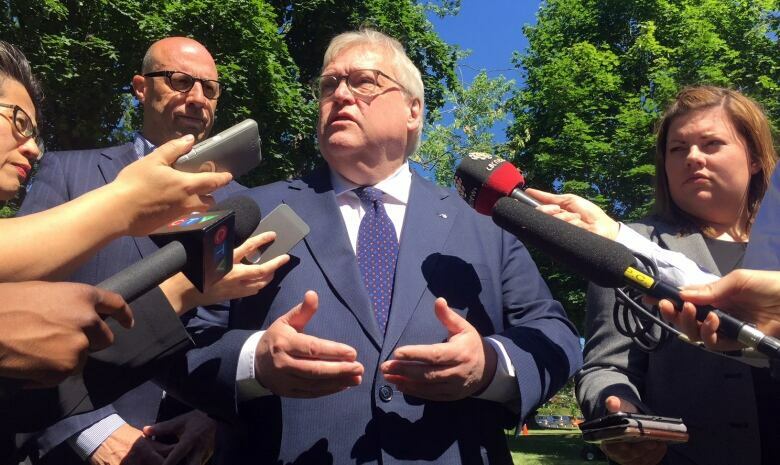 So far, a few MNAs have shown interest, according to CBC political analyst Bernard St-Laurent — Gaétan Barrette, Pierre Arcand and Christine St-Pierre. Many are questioning whether Barrette should be in charge, considering how unpopular he was among large swaths of Quebecers. St-Laurent said there are pros and cons to the outgoing health minister taking over. "On the upside, he would be very good in the National Assembly in terms of keeping pressure on the CAQ, but a number of people in caucus think that he is just too abrasive," St-Laurent said on CBC Montreal's Daybreak. St-Laurent said the party doesn't need to pick a new leader in a hurry, and should instead focus on reassessing its raison d'être.